Four times more tankers were sold for demolition during 2017, as the market “goblins” trigerred more scrap sales. Meanwhile, as shipbrokers report last week, the freight market revival of the dry bulk and container segments, meant that there were less demolition candidates to emerge from these sectors. According to the latest report from shipbroker Clarkson Platou Hellas, “with the shipping world looking healthier than recent years and freight markets recovering in the Dry and Container sectors, the recycling markets supply of tonnage has been significantly cut by around 20% this year. The saving grace has been the struggling Tanker sector which has contributed about 10.7m dwt of tonnage which is four times as much as last year where only 2.5m dwt of wet tonnage headed to the recycling yards and being one third of the overall 34.0m total dwt in the market”, said the shipbroker. However, it added that “with Pakistan still being unable to import tankers all year, recyclers from this destination had to be aggressive in purchasing the alternative units such as bulkers and containers and have produced some of the highest prices seen for several years. The Gadani recyclers have set the pace all year and blew its rivals out the water for any market dry tonnage. The main importers of tanker units has been the Bangladeshi recyclers who have once again had a busy year acquiring the majority of wet tonnage that has been for sale and especially being active in the VLCC/FPSO sector taking the 14 that were sold for recycling this year, the highest seen since 2013 when 17 headed for the recycling yards”, Clarkson Platou Hellas noted. It went on to mention that “as ever, India continues to progress at an impressive rate in improving the standards of their recycling yards as more green yards are being HKC ratified with focus by the Government to implement Green recycling throughout the Alang shoreline with permeable concrete flooring one of the stringent necessities. It has been another impressive year for Turkey, where it has been busy in purchasing a large volume of units again across all sectors as it also broke through the 300/$ldt ceiling as it made substantial gains from last year. Also as with all yards in Aliaga being fully ratified by the HK convention, it will most likely continue to be an attractive option for Owners who wish to sell to Green yards and still obtain a strong price, particularly for tonnage completing in the Mediterranean. China has remained quiet throughout the year and this has meant that several yards have unfortunately closed. The end of the subsidies imposed by the Government 4 years ago is coming to an end this year and it will be interesting to see how recyclers react next year and whether they will now start to compete with the Indian subcontinent”, the shipbroker concluded. Meanwhile, in a separate note, Allied Shipbroking said that “with the year coming to a close, and with a clear picture having now emerged over the full year figures for activity in the ship recycling market, it is a good time to take a small review. The market witnessed a considerable recovery in terms of scrap prices, with 2016 having been a year of relative lows in the market, 2017 witnessed a rejuvenated market demand, while the relatively slower flow of demo candidates coming to market helped keep competition amongst breakers alive and kicking. In terms of activity, things were considerably slower, and the lowest volume seen in over 5 years. However, in terms of LDT, the total number is relatively high, especially when comparing with that of 2015 and 2014. This immediately leaves us with the fact, that this year we saw an enhanced number of demo candidates in the bigger sized vessel segments. This could also be translated as one of the main culprits for the huge jump in scrap prices, compared against previous year. 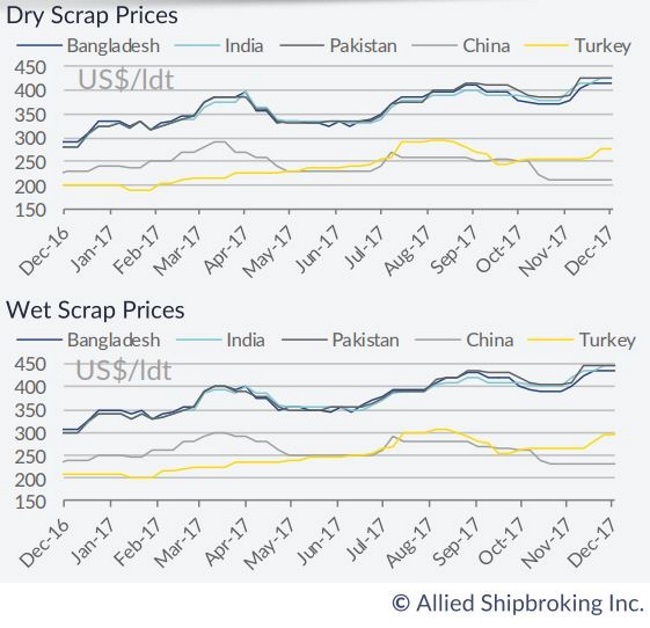 Given the improved sentiment now held with regards to shipping markets overall and the stronger demand being seen for scrap steel, we could well see a fairly firm ship recycling market evolve during 2018 in terms of scrap prices”, Allied concluded.